OK. So, if you do have Bigz dies in your stash yet, are the images that you can cut with it on the smaller size? Like the smaller of the three stars in the photo above? Great! You're set! You can make your own custom -- unique! 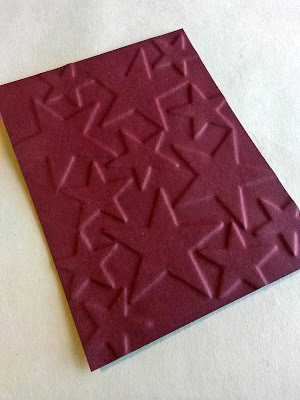 -- embossing plate! I won't say folder, because it's not; it's just a plate. The next thing you need is the backing from a tablet of paper. You know, CHIPBOARD. Yup. Grab a piece of that and start cutting your shapes. 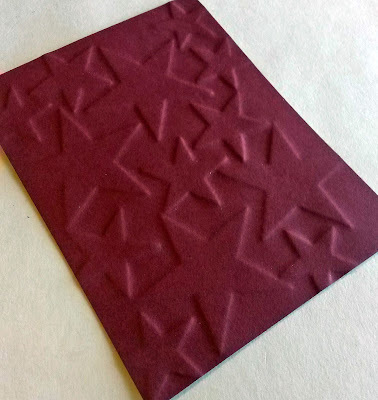 When you finish with the cutting, arrange the shapes so they fit well onto a 4 1/4" x 5 1/2" piece of cardstock. When you are happy with the arrangement, glue the shapes in place. NOTE: If you do decide to create your own embossing plate(s), remember to make your base of a size that will fit through your die cutting machine. 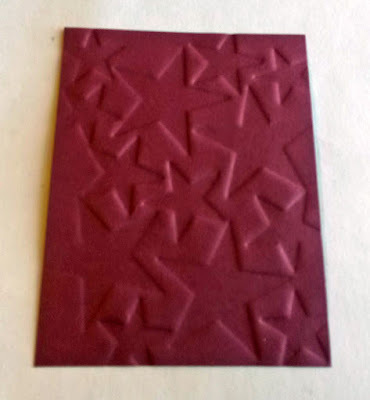 The following photo shows my completed embossing plate lying atop a piece of the chipboard I used. Actually, I receive a FREE piece of this chipboard each and every month inside my Paper Pumpkin kit! Be a hoarder and save those wonderful things that a lot of un-savvy crafters would simply toss in the trash. BE ME! Then, when you have a wonderful creative inspiration, you have the materials on hand! Yay! Win-win! Now, the next thing you need is a rubber embossing mat. Stampin' Up! sold them in the past, but they are no longer in the catalog. 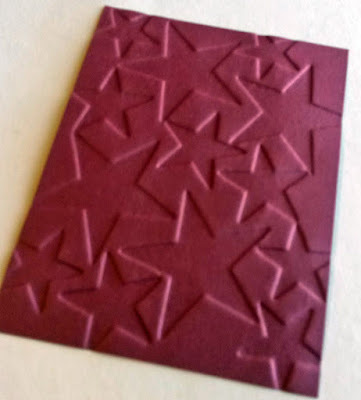 HERE is what you get when you do a Google search for "rubber embossing mat". Otherwise, I've heard crafters mention that they simply use rubber gasket material that they've purchased in the home improvement department. THIS is what shows up when I do a "rubber gasket" Google search. At least, you'd get some ideas from these links. 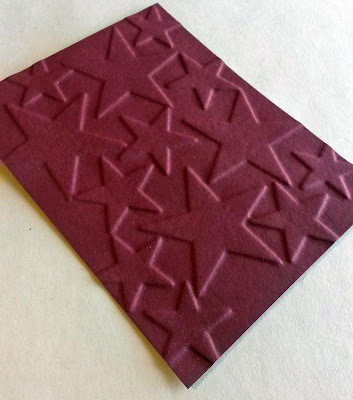 To make the sandwich to do this sort of embossing, for the first trial, which is shown below, I simply used the same sandwich I would use when incorporating an embossing folder. Except, instead of the top cutting plate, I replaced that with the rubber piece. It turned out a little "soft" for my taste. In the following two photos, I am showing the front and back of this first attempt. In an attempt to get the embossed portions a little crisper, I added a shim, and tried it again. The next two photos show the results of this. Better, but still not sharp enough. I figured I needed a shim with a bit more oompf. So, do you know what I used? Uh-huh. I added the sheet of chipboard from my Paper Pumpkin kit. Sent it through the Big Shot, and, voila!, I was pleased. One thing I must mention is that each Big Shot is calibrated a little differently, so if you try this method of embossing, you'll want to experiment with your sandwiches to see what works best for your machine. Well, with such a great embossed piece, I just HAD to do something with it. Right?? For my card, I decided to let the sunken-in stars side be the "star" of my creation. I also didn't want to cover up too much of the embossing, so I opted for a fairly simple card that showcased the embossing. I trimmed my embossed piece to 4" x 5 1/4". 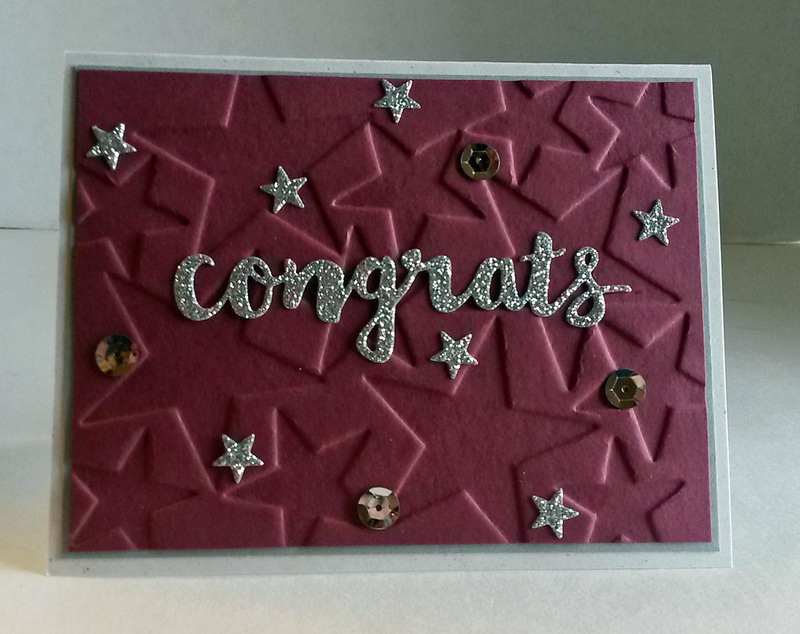 I liked that because it left the stars running off the edge a bit, giving it a much more effective look than if the stars simply ended at the edge as would have happened if I'd used the piece the same size as my embossing plate. I grabbed some silver glimmer paper and went to work. 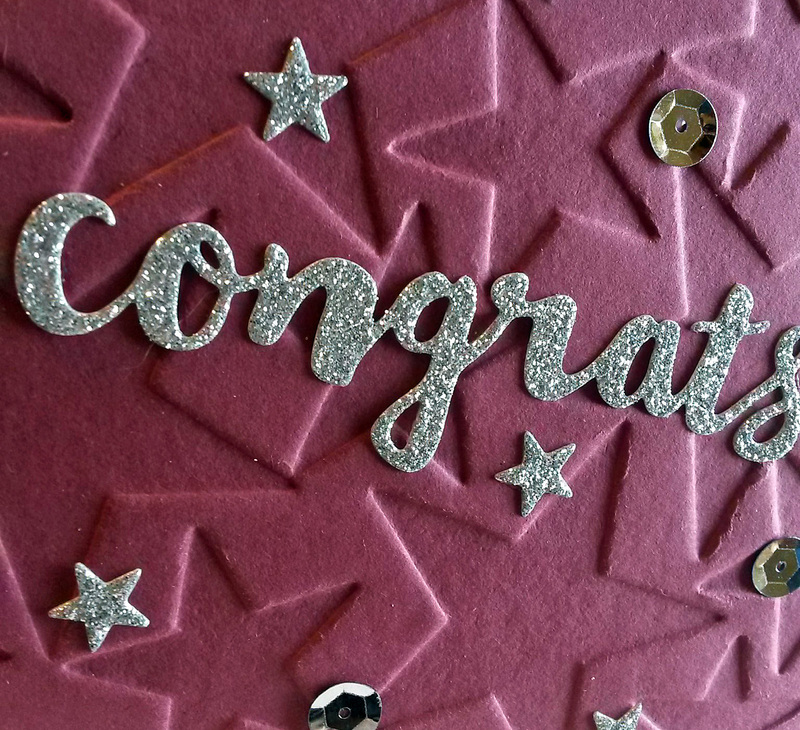 I used the "congrats" from the Sunshine Wishes Thinlits (page 194 of the current big catalog). For the twinkly perfect-sized stars, I die cut a strip of the stars from the Mini Treat Bag Thinlits (page 191 of the big catalog) out of silver glimmer paper. I also added a few silver sequins. Don't you just love the look of this homemade embossing? Even though the Bigz dies are not as popular as they were a few years ago, and if you don't have any on hand anyway, you can still make your own embossing plates with current dies. You can use Framelits or Thinlits with cardstock. The only thing is, you'll have to make many more of the diecuts. Since they are much thinner than those that can be produced with a steel rule die such as one of the Bigz dies, that can cut through much thicker materials, you will have to stack several of them and glue them together in order to get enough thickness for the depth you will need to do embossing. 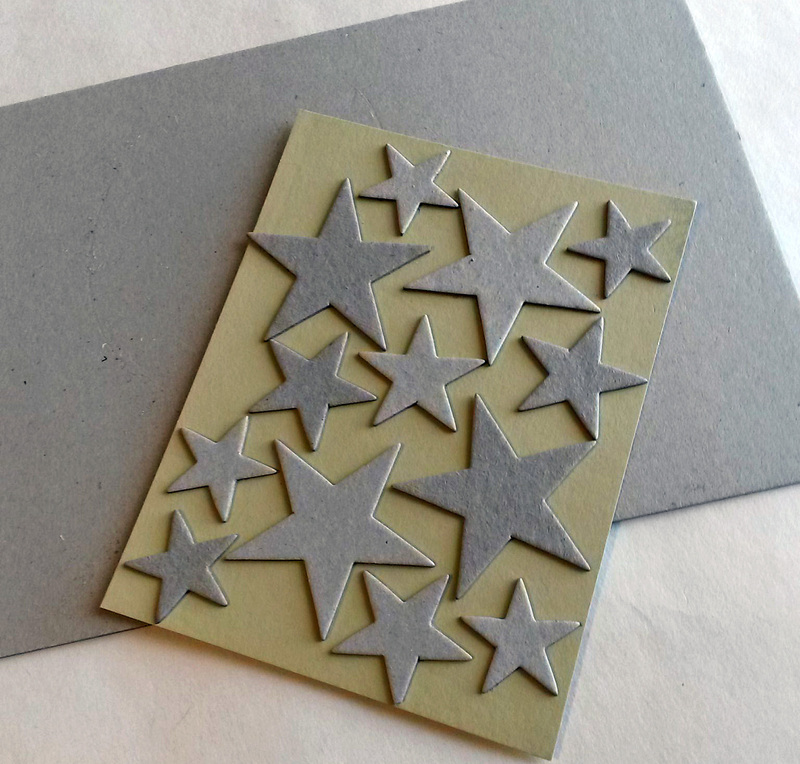 So, even though it would be somewhat more time consuming, it is possible to make a truly charming embossing plate with any of the darling tiny Thinlits/Framelits that are available. You could also use punches. Have fun with this great technique! Just think, the embossing that you will be able to do will be totally UNIQUE -- your embossing will be like no one else's in the whole wide world! What a feeling, eh? that's cool!! I love when you show us how to make our own tools! Thanks for sharing on the Pleasures of the NW's DIY link up! 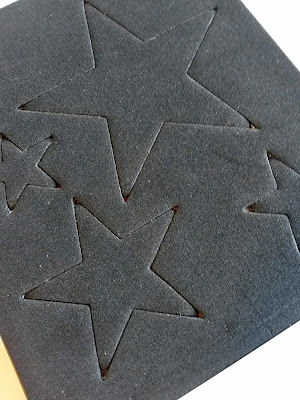 Linda, I love this idea for a handmade embossing plate! And your card is beautiful too! Pinned to share. You make the most incredible cards and give so many wonderful tips. Thanks for sharing at Over The Moon Party. Very cool! 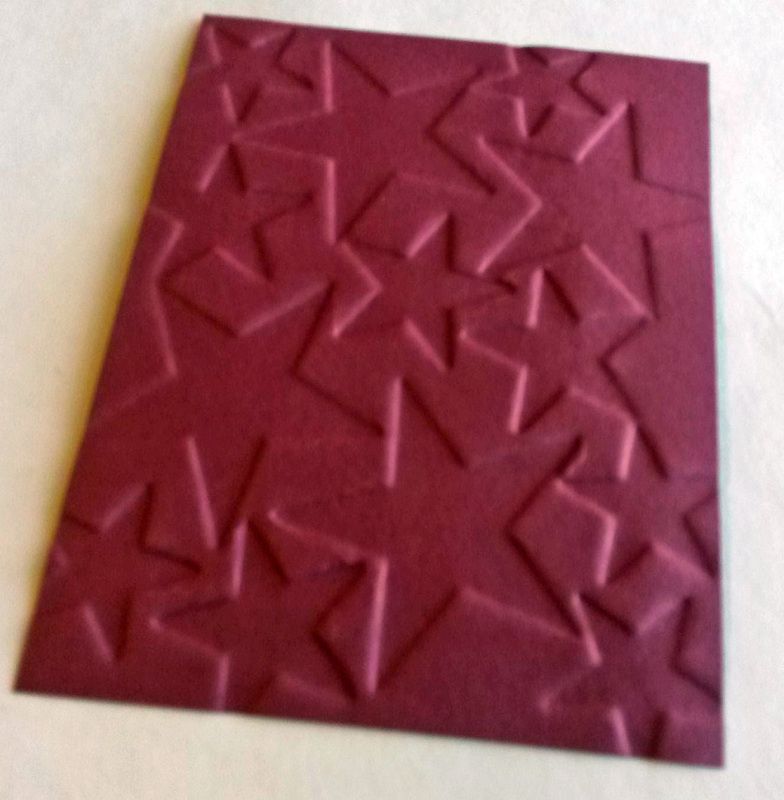 I'd like more embossing folders/plates, but I don't really want to buy them. Thank you for the tips on how to make your own! Oooooooo guess what Linda, my Sizzix Big Shot is on it's way, whoop, whoop. Happy dance. I can't wait to try some of the tips you've shared. I'm going to have so much fun. Yay, Michelle! You are in for a wonderful time -- and you will wonder how you lived so long without it! It is my favorite papermaking necessity! If you need any help or guidance, just let me know! Have fun! A great idea! You're so creative :) Thank you Linda for attending the #WednesdayAIMLinkParty. I shared your post. Thank you for sharing your creative cards. I never knew that handmade cards could be so pretty until I found yours.